Move over, summer shandy. There's a new libation in town in the form of spiked seltzer. If you haven't heard of spiked seltzer, you might not be running with the right crowd. The drink is a carbonated sparkling water spiked with nearly 5% alcohol by volume (ABV). It boasts close to the same buzz-inducing ABV as most light beers, but it has quickly attracted a loyal following among millennials for its low carbohydrate, sugar and calorie counts. Hard seltzer was a $60 million industry heading into last summer, according to Nielsen data. Now by some estimates, the industry is hovering around $500 million in sales. . 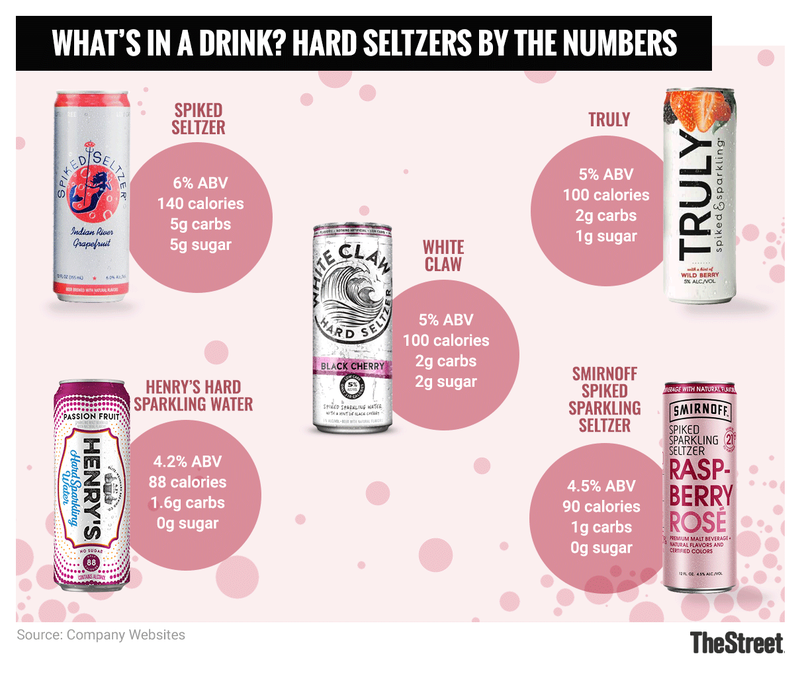 Here's why experts tell TheStreet that hard seltzer is about to be the alcoholic beverage for the summer...and perhaps the rest of 2018. "Last year the hard sparkling category took off like a rocket with over 400% growth. It was largely driven by a few key players in the market," said Katie Feldman Lefsrud, associate marketing manager for Henry's Hard Sparkling Water. "Five or so core brands saw huge exponential growth." Henry's is among those five brands, by most measures. It also serves as a handy example of the ways in which larger legacy beer and liquor companies -- battling years of mixed sales -- have pounced on the nascent hard seltzer space like a lion stalking prey. Most seltzer drinkers would largely agree that the "Big Five" in the space (owned by the biggest beer companies) are SpikedSeltzer, owned by AB InBev (BUD ; Henry's Hard Sparkling Water, owned by Molson Coors (TAP - Get Report) ; Truly, owned by Boston Beer Co. (SAM - Get Report) ; White Claw, owned by Mike's Hard parent Mark Anthony Co.; and Smirnoff Spiked Sparkling Seltzer, owned by Diageo plc (DEO - Get Report) . While most of those big firms don't break out sales figures for each of their forays into spiked seltzer, there's no denying it's become a space ripe for growth and profit. "Spiked seltzer is continuing to deliver triple-digit growth," Boston Beer founder Jim Koch said on the company's first quarter earnings call. The Truly brand owner added, "We continue to believe that hard sparkling water will be an ongoing product mix where we can and will play a very strong role." Attorney Marbet Lewis of LewisFox, a law practice with a large portion of its business devoted to the alcohol space, also expects the industry's ascent to continue. Lewis, who recently turned 40, explained that she and her friends used to go to the beach and drink wine coolers in their 20s, before they were concerned much with what went in their bodies. "If I did that now I would have to jog home from the beach," Lewis said. She's an avid hard seltzer drinker, she said, adding, "This is a product that I'll continue to drink, even beyond the summer months and beyond the partying." Lewis isn't alone in her characterization of hard seltzer as a "healthier" option. Henry's is the least caloric at just 88 calories per slim aluminum can, but none of the market leaders have more than about 140 calories. "We know that the general public is more excited and conscious about what they're choosing. Calories and sugar content are the top two drivers of choice," Lefsrud said. Plus, it's a cunning play on the recent popularity of non-alcoholic seltzers. There's little hiding the fact that La Croix, a subsidiary of National Beverage Corp. (FIZZ - Get Report) , has become the de facto drink of choice for the upwardly mobile with its flavored fizz. Other beverage players such as Coca-Cola (KO - Get Report) and PepsiCo (PEP - Get Report) have also ventured into the space, pushing up the profile of sparkling water. Sales of domestic sparkling bottled water -- excluding imports such as San Pellegrino - doubled between 2015 and 2017 to $8.5 billion, according to the DrinkTell database. "Those two factors [calories and sparkling water interest] lead to a really brilliant positioning for something like White Claw," said Andy Rohm, professor of marketing at Loyola Marymount University. The brilliant marketing and current consumer trends could spell trouble for the more traditional light alcohol options. At the summer barbeque this year, watch for who picks a Bud Light Lime or a Michelob Ultra over a White Claw or a Truly. "This is a threat to the low-calorie light beer market because brands like White Claw can eat into both shelf space and marketing space for legacy light beers. Positioning goes beyond just the products themselves," Rohm said. That's part of the ingenuity of a legacy firm buying up a hard seltzer brand or creating one from scratch. Not only can they manage the profits lost to a new market player, but they can also utilize what's in many cases a decades-old distribution network to ensure success. "As the hard seltzer category becomes more prominent in 2018, these larger companies have almost built in distribution," Rohm said. "That's going to help them not only command shelf space but fight off smaller competitors." More on the markets from TheStreet here. Editor's note: the infographic in this story has been updated to reflect Henry's Hard Sparkling Water's current packaging.